Photograph of Kumbhalgarh fort from the 'Reading Collection: Views of Udaipur taken by an unknown photographer c.1910. 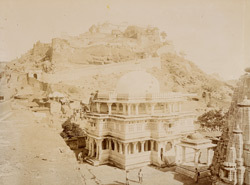 The photograph is part of an album containing architectural and topographical views of sites in Rajasthan, mainly of Udaipur, originally in the collection of Rufus Daniel Isaacs, Lord Reading, who served as Viceroy of India (1921-1926). Kumbhalgarh fort, 84 km north of Udaipur, rests on a hilltop in the Aravalli range at 1100 m. Chittaurgarh fort and Kumbhalgarh fort were the two most important forts used by the Mewar Rajputs in their battles against the Mughal Emperor Akbar (r. 1556-1605).